Google has renewed a deal to remain the default search engine within Mozilla's Firefox web browser. The non-profit foundation said it had "negotiated a significant and mutually beneficial revenue agreement" with Google for the next three years. Some analysts had predicted Google would back out of the deal as it tries to grow the market share of its Chrome browser. Mozilla relies heavily on the income generated by search partnerships. "Under this multi-year agreement, Google Search will continue to be the default search provider for hundreds of millions of Firefox users around the world," said Gary Kovacs, Mozilla's chief executive. Alan Eustace, Google's senior vice-president of search, said: "Mozilla has been a valuable partner to Google over the years and we look forward to continuing this great partnership in the years to come." The foundation said the exact terms of the deal would not be disclosed. In its accounts for 2010, the Mozilla Foundation said it earned $121.1m (£77m) from agreements with Google, Microsoft and others. The Google agreement was thought to make up about 85% of that amount. The previous deal, which ran out in November, was signed before Google's Chrome browser had gained a presence in the so-called "browser war". Some internet monitoring organisations suggest Chrome has overtaken Firefox to become the world's second most widely used browser, behind Microsoft's Internet Explorer. Many put this down to lavish advertising campaigns undertaken by the search giant across the world. Chrome's launch and subsequent growth has now put it in direct competition with Firefox, yet Google remains financially responsible for Mozilla's survival. But Whit Andrews, an analyst for Gartner, was not at all surprised by Google's decision to continue backing the browser. "What Google really wants is more advertising on the internet. It's very simple. If it drives more ads on the internet, they're into it. "Google want the shelf space. There's a shelf sitting there and they've got a product. The fact that the shelf is with a competitor, they don't really care. The alternative is that another competitor gets the shelf." 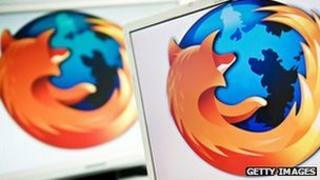 Firefox 9, the Mozilla browser's latest incarnation, was launched on Tuesday. Mozilla said it was "30% faster" than previous versions - a problem that has been cited by many users switching to Chrome.